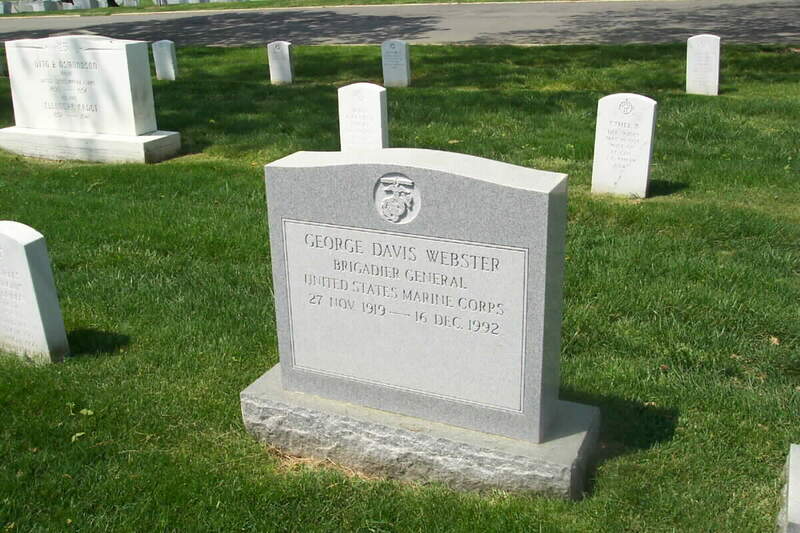 "George Davis Webster, 73, a retired Brigadier General in the Marine Corps who served in the Pacific in World War II and who had two tours of duty in Vietnam during the conflict there, died of cancer on December 16, 1992 at the Bethesda Naval Medical Center in Maryland. "He was commander of the Quantico Marine Base when he retired in 1971 with 30 years of service. He was commissioned in the Marine Corps in 1941. His early service in World War II was in the Panama Canal Zone. In 1943,he went to the Pacific as a Weapons Company Commander in the 4th Marine Division, and he took part in operations at Roi-Namur, Saipan, Tinian and Iwo Jima. In the course of those campaigns he was awarded two Bronze Stars and the Purple Heart for wounds he received in action. "After various postwar assignments in this country, General Webster attended the Defense Language School and then went to Rome as an Assistant Naval Attache. Later he was a Battalion and Regimental Commander at Camp Lejeune, North Carolina, and then Commandr of the Landing Force Training Command at Coronado, California. In 1962 and 1963, he was in Vietnam as an Intelligence Officer on the staff of the U.S. Military Assistance Command. In 1968, after further duty in this country, he returned to Vietnam as Assistant Division Commander of the 1st Marine Division and commander of a formation called Task Force X-Ray. He was then assigned to Okinawa before going to Quantico for his final assignment. "In addition to his World War II medals, he had three awards of the Legion of Merit. "He was born in Macon, Georgia, and grew up in High Point, North Carolina. He graduated from the University of North Carolina. An Alexandria, Virginia, resident, he had maintained a residence in the Washington, D.C. area since the early 1950s. He was a member of the Army-Navy Club and the Westminister Presbyterian Church in Alexandria. Survivors include his wife of 46 years, , the former Dulcie "Dee" Davidge of Alexandria; two children, a sister and four grandchildren." He is buried in Section 11 of Arlington National Cemetery.